Image © DC Comics. Written by Dan Jurgens, art by Marco Santucci, colors by Hi-Fi, letters by Dave Sharpe, cover by Mike Perkins. 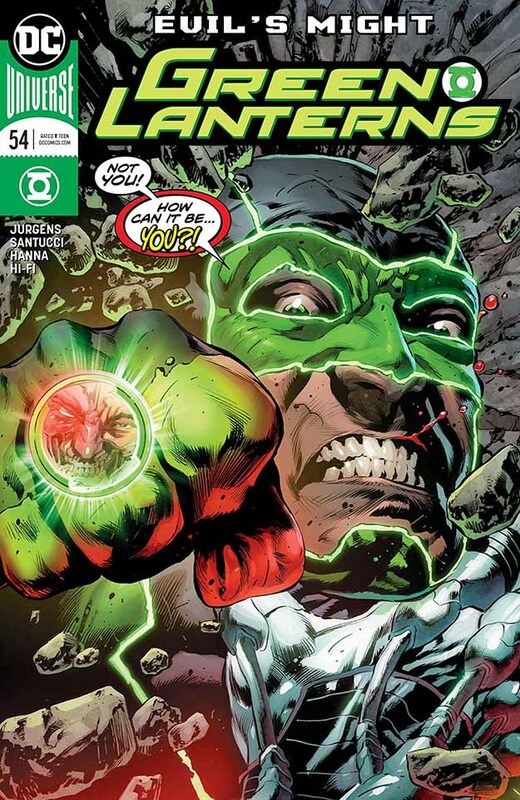 Part Five of “Evil’s Might” begins with the top GLs questioning Simon Baz’s loyalty, as he left the scene of battle with the Ravagers suddenly, creating a crisis that was only resolved by the arrival of Hal Jordan. Baz said the Guardians told him to, but the Corps has been out of contact with the Guardians for some time. Simon’s partner Jessica Cruz defends him, but it doesn’t look good for Baz. Meanwhile, on Earth, Simon is following the request of Superman to free him from his own Fortress of Solitude where he says he was imprisoned by Brainiac. When Simon does, his inexperience and foolishness is soon apparent. This issue moved slower than previous ones, with a protracted battle scene. As I’m not fond of those, I didn’t enjoy it as much, but the overall story is still worth reading, and the true villain is finally revealed. Recommended. This entry was posted in Comics, Reviews on October 16, 2018 by Todd.